We Do Corporate Events Too! This Could Be Your Party! Reel Ting provided us with awesome entertainment for our Jimmy Buffet themed party at our house . Would use them again for another event . George is one cool cat . These guys are 'over the top' professional! Have had the opportunity to hear the band in a couple of venues and really love their music, their professionalism and their performance. The whole party rocks and participation is great. Highly recommend Reel Ting and their sister bands for anything! The Reel Ting Steel Drum Band and The Steel Boyz is one of the most frequently hired live bands and wedding bands, Club Band Corporate Bands Caribbean Band Steel Drum Bands in Florida. They are one of the most popular choices when it comes to live music and we are proud to have some of the top steel drum players musicians and entertainers in the state. They provide Steel Drum Music, Calypso Music and Reggae Music for Weddings (over 65 weddings a year), Beach Weddings, Island Weddings, Destination Weddings, Wedding Ceremonies, Corporate Events and Conventions. We also provide Caribbean Music and Island Music for holiday parties, Christmas parties, house parties, pool parties, birthday parties, anniversaries, retirement parties, graduation parties, fundraisers, christenings, or any other special occasion. 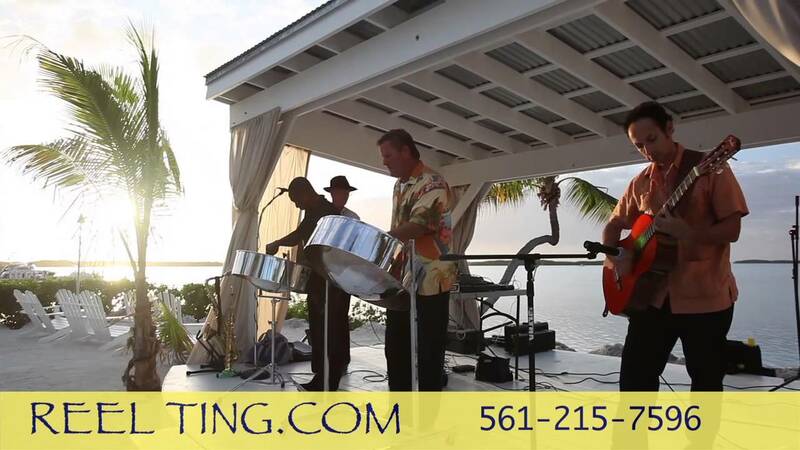 "Reel Ting" is a popular Caribbean Steel Drum band located in Southern Florida that specializes in tropical island destination weddings. The band was started by a number of dedicated and talented musicians and, as word spread, the band was recruited to play venues from as far North as New York to as far South as the Florida Keys. All of the Musicians have had many years of experience performing and come from vast musical backgrounds. "The Reel Ting" music can be appreciated by everyone, no matter what age. Both young and old can generally be found singing and dancing, bridging the generation gap in the music culture. This is because “Reel Ting’s” music ranges form Harry Belefonte's famous Caribbean song"Yellow Bird" to Bob Marley's hit "I Shot the Sheriff". For the young at heart: Shaggy's "Girl Your My Angel"or Jimmy Buffett's "It's Five O'clock Somewhere" and the Country sounds of Johnny Cash's "Ring of Fire". While on stage, the musicians teach different dances to the crowd, as well as many other 'follow-me' routines. The band is very professional, both in their attire, and approach to every event. The "Reel Ting" Steel Drum Band pride themselves on professionalism and many band members have studied music at a higher educational level. The band's unique Steel Drums and Horns bring out the best sounds for Weddings, Private Parties and Concerts. We do it all! No matter what the occasion, The "Reel Ting" Steel Drum Band welcomes the opportunity to perform at your event! We encourage you to view our videos and listen to our .mp3 samples. Don’t settle for second best when you can have the “Reel Ting”! The Reel Ting Steel Drum Band is well known for their high-energy and interactive performances. The musicians are all from the islands, giving you an authentic, Caribbean sound. While on stage, the Reel Ting Steel Drum Band and The Steel Boyz teaches different dances to the crowd, as well as many other 'follow-me' routines. The band is very professional, both in their attire, and approach to every event. The Reel Ting Steel Drum Band always arrives early and starts on time! and is soothing to the Soul and touches heart of all generations. Weather its Bob Marley's famous songs such as I Shot the Sheriff, or Red, Red Wine or Jamming, they will certainly get your parties groove on. In addition to the list of satisfied clients listed above we have added some new Corporate Client and Country Club clients in the past few years such as: Lost Tree Village located in North Palm Beach Florida , Admiral Cove Country Club located in Jupiter Florida, The Presidents Club located in West Palm Beach Florida Jonathans Landing located in Jupiter Florida, Frenchman's Creek located in Jupiter Florida Key Largo Holiday Inn ,Key Largo Florida and several other establishment in the Florida Keys and weddings throughout Florida and West Palm Beach and Palm Beach County, Dade Count and Monroe County. Gillikin Custom Boat Cruise Lines, American Cancer Society, Stuart Florida, Harley-Davison Motorcycles Company Stuart Florida and West Palm Beach and Daytona Florida Coke Corporate Meeting West Palm Beach Florida, Marriott Vacation Club, Islamorada Fish House Islamorada Florida keys, West Palm Beach PBI National Airport International Airport, Philadelphia Eagles National Football League Monday Night Football Game Miami, Florida ,Citizen Bank Park Philadelphia Pennsylvania Fund raiser concert, Sunrise Theater Fort Pierce Florida ,The Lyric Theater Stuart Florida, Governor of New Jersey Political rally Wildwood New Jersey, Stadium Grill Abacoa Jupiter Florida ,Sugar Cane Bistro Jupiter Florida, Square Grouper Jupiter Florida, Sugar Cane Bistro, Jupiter Florida, Bank Atlantic Port Saint Lucie Florida, West Palm Beach Florida, Palm Beach ,East Coast Mortgage Corporation ,Palm City Florida, Board of Realtors ,Stuart Florida Treasure Coast, Jack Nicklaus Professional Golfer Fund Raiser Children Hospital West Palm Beach Florida, Abacoa Town Center Grand Opening event Jupiter Florida, Marisol Country Club Honda Classic PGA event West Palm Beach Florida. The Reel Ting Steel Drum Band and the Steel Boyz have been home grown and raised with performing Superstars such as reggae superstars Shaggy, Inner Circle, Ziggy Marley and Sean Paul. Performances have taken us as far as New York, New Jersey .Abacoa Bahamas, North Carolina, South Carolina, and throughout Florida and the Caribbean. No matter what the occasion, or where it may be, The Reel Ting Steel Drum Band and The Steel Boyz welcomes the opportunity to perform at your event! To view videos of the band, listen to audio clips, and read testimonials from past clients, please visit our website. In January2009 we hired The Reel Ting Steel Drum Band to play at our club Admiral's Cove Yacht Club Party located in Jupiter Florida. The Reel Ting Steel Drum Band Played at our event and did a tremendous job. They were the Best Band we have ever hired at the Club in the past Twenty-Five Years. They let our members join in on the fun and participate with their instruments and we can not wait to hear them again. Hats off to a job well done !!! !.The Reel Ting Steel Drum Band were professional - very organized, and great musicians. 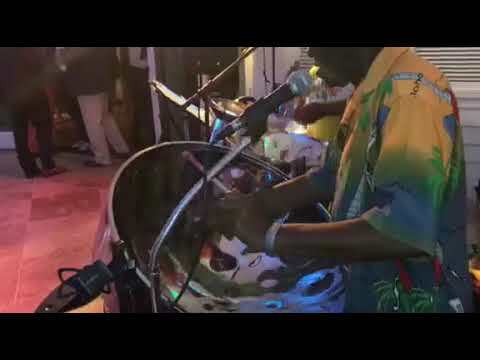 The Reel Ting Steel Drum Band played at our Caribbean Night event at The President Club located in West Palm Beach Florida in April 2009. They were outstanding! 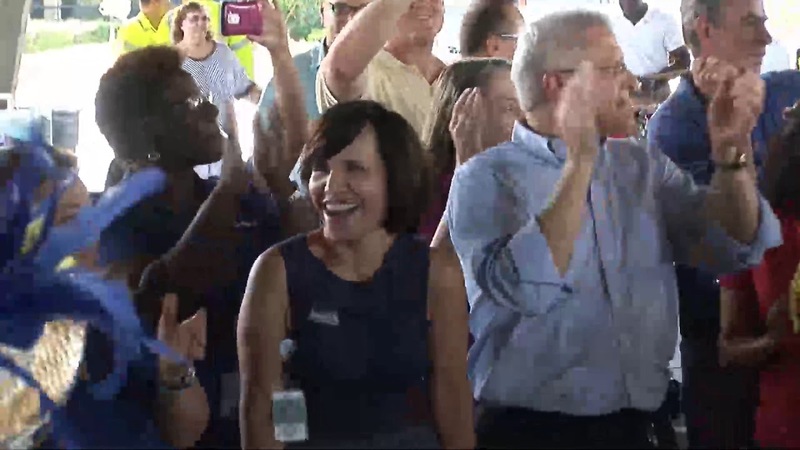 They had everyone up and dancing and having a great time. I would highly recommend them for any event. Their Steel Drums and music proves to be the best in the industry. We have just booked them for an upcoming Wedding event Show in the fall of 2009.